I'll be making a new thread for it, because why not. Right now the only things holding me up is finishing a basic in client guide, updating the deflists for the classes, fixing all the little quirks, and combing through the extra useless code and cutting it out. If anyone wants to volunteer to help, I've got a handful of tasks. I've been tinkering with Source for a short while now. I've made a few fixes and added a few features with help from others who are also using the system. There's still a lot to do, but to make things easier for everyone, I decided to start a new thread specifically for my version of Source, which I'm going to call 1.3 (and updates will be 1.4, 1.5, etc...). This post will be edited with each new update. These aren't all the details, but here's the changelog. If you need details, please message me in Aetolia, just wrap your message in (()). Keep in mind the first time you load it, it'll ask you to read the changelogs. New version of source 1.3 uploaded! Fixes Monk keys/aliases already there. Adds Ascendril/Sciomancer reflection charge tracker. Adds trigger for Shaman familiar bashing, morphs the familiar from bear or serpent (you have to have one of those types out for this to work, or tweak the trigger) when the familiar is almost dead. For the record, Monk issue was: aff_tracker.enemy_afflictions.shield needs to be replaced with pvp.affs.shielded and the pvp.affs reset script need to have shielded = false added after lifeaura. Download 3 files (SourceCurrent.trigger, PersonalPrime.trigger, install.txt) and the ps folder, which are grouped in a single rar file. If you need to just update, just download the rar and only use the 'source.trigger' and delete the rest. The install details are in Install.txt, but I also put them in this post. If you have any trouble, seek me out in Aetolia and I'll gladly help you setup the system. This is for a clean install. A clean install means you are installing this for the first time on a new profile in Mudlet. 1.) Click on the first icon 'Connect' or 'Games' and 'Play' to bring up the profile selection window and click on +NEW button. Name your pofile whatever you'd like and have Server Address: NOTAetolia.com Port: 23. Hit 'Connect'. "[ ERROR ] - Host name lookup Failure! or your nameservers are not working properly. *You will notice that the game isn't connecting, this is intended. You can not edit preferences until connected to a world and that's what we want to do right now. 2.) Depending on how you have your mudlet setup, you will want to get to 'Preferences' or 'Settings'. If you have pretty icons, click on the wrench labeled 'Settings'. If you have the the menu bar, it is 'Options'-> 'Preferences'. Word Wrapping -> Wrap lines at: (default is usually 100) I suggest making this 80 or 85 to start. 4.) Now either click on 'Toolbox' -> 'Script Editor' or click the 'Scripts' button to bring the script editor. There is a button that says 'Import' and when you click on it, you will want to go ahead and import 'source.trigger' and then 'personal.xml'. When this is done, you can close the script editor. 5.) Now that you have a new profile, move the 'ps' folder to that profile directory. This can be found at ' C:\Users\_____\.config\mudlet\profiles\ '. Where '_____' is your computer usename/profile name. 7.) Reopen mudlet. In the top left of the menu bar, click on 'Games' -> 'Play' or if you didn't disable the buttons, click on 'Connect' to open the profile select window. Select your profile and remove the 'NOT' from the server address section. Then click 'Connect'. 8.) When prompted, select 'DOWNLOAD MAP'. 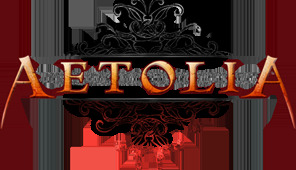 Go ahead and login to Aetolia. You will be greeted by a wave of system spam, but if everything is working, your UI display should have changed. 9.) Send the command 'L' to look, which should update your map on the right. 10.) 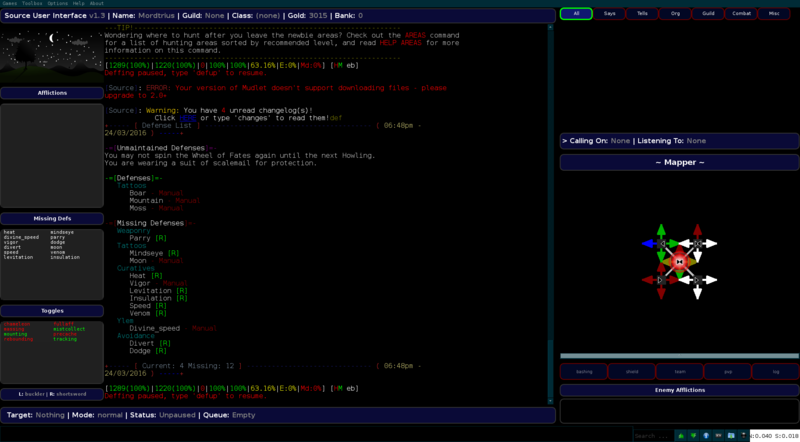 Send the following command, 'setupfirstaid' without the quotes to setup the ingame firstaid system. This only needs to be done once. 11.) Just some pointers: 'setting' will show you a lot of what can be changed or updated, such as pipes, mount, and other things. Be sure to ask in game to join 'Project Source'. This is an OOC clan for further questions. CLANHELP PROJECT SOURCE to see who can induct. If you intend to receive the future updates of Source, ensure any changes at all go into the 'Personal' section of your script editor. This includes: Aliases, scripts, triggers, keys, or other additions you would like to add or change. If you notice bugs or mistakes and fix them, notify the forums or Aoi so they can appear in a future update. If you come across a room that is unmapped, such as the Wings or Amulet artifact rooms, simply type MAP HERE. Hey, this isn't working quite right for me (I also see no one who can induct me into the clan at the moment). Help me out? I'm on linux and it sounds like most of you are on windows. I followed all the instructions though. It complains I don't have a new enough mudlet (picture proving I do) and line wrapping appears to be off. Also, is there a user manual or something? Sorry to be spamming, but for anyone else who had the "cannot download files" error it was due to my lua installation missing lua-zip and lua-filesystem. I installed those and everything is better. Figured it out due to an error message at the very top of the output when the system loads. @Mordtrius Did you ever get everything sorted out? Also, forgot to add, there -WILL- be a user manual coming soon. That's kinda the first thing I'm working on before another round of improvements and it'll be posted as soon as its ready. I've just been held back due to schoolwork and workwork and being incredibly lazy. Updated basher with smart targetting! Updated FIRSTAIDSETUP to fix priorities. May also make firstaid dominant Tree/Focus/Endgame curing engine. A barebones offensive for every class I have access to, with lots of healthy notes as to how it was made and how it works so you can do it yourself! An option to get rid of the UI except for the chat log and map. Be sure to message me in Aetolia before posting, as I'll probably respond to a message faster than here. Not sure if there is a real fix besides someone manually updating the line with their whip info, but thought I'd share. I might be missing something here, but how do i stop the spam that comes with the DefUp alias? It is trying to add defenses that I do not have. @Claito It depends on which defence it's trying to spam. Some can be set for the specific skill that you may have, and some you'd need to hide them in the code until you learn the skill. Do the affliction tracking trigs and scripts work in PS? If so, are they reasonably up to date? The aff tracking, is uh, not so great. It misses paresis triggers(I think), and may need some updated discernment stuff. Just downloaded this as a new player migrated from MKO. Lots of familiar elements. Looks like a great system! Thanks for putting it together! Just as a reminder for anyone who uses Source, there is a clan for coding help and system help called Project Source. Feel free to send me a tell or message (sometimes I'm offline or off plane) and I'll invite you. Alternatively, CLANHELP PS will give you a list of who can invite you beyond just myself. Hi! So, @Zsadist was kind enough to start to help me with this, but even his fix was a bandaid that kind of stopped working after a few hours. It seems that the basher just simply won't work for my Syssin, it'll proc on the nearest mob when it enters a room, send garrote once, and upon balance regain, just sits there, doing nothing. I have autobashing on. It wasn't even sending bite earlier, before I learned garrote. You can also put temporary test echoes into the function itself to help you track down how far the function gets before it fails, or try opening the debug window and watching for large blocks of red-highlighted text, but that tends to be so spammy it is only helpful sometimes. I am pretty sure someone else had this problem and it was a case of the syssin bashing trigger being outdated. Try to search for garrote, syssin or whip and see if you can't find a line that's similar to it but not quite right. @Xanchol hit me up when you log in today. I'll see if I can figure out the problem or even expand on the fix I gave you myself. So at someone's suggestion, I did a complete wipe, since @Zsadist's basher stopped working again (Sorry bro.). New Source download, new profile, entirely. EVEN tried it on my other profile, which also uses Source 1.3, and is on Mudlet 3.0.0-delta, which works for my other character, and still, problems- no mudlet map, basher won't work, pvp button is fried. So is it something wrong with Source against Syssin? Or is it something corrupted in the character data itself? Have you done setupfirstaid yet? That's step #1 for Source. Syssin bashing isn't very good the higher you go (from my knowledge) so there is also that. Health and mana sips are ~5 seconds from being able to sip again. This is across the board for everyone. As for your other problems, I do not know where to begin to address that. @Xanchol , did you ever get this to work for you? I have the -exact- same problem. Idk about the pvp button because I haven't tried it yet, but my mapper is acting weird, my prompt isn't getting over ridden by source like I'm told it should, and my bashing is exactly as you described. At least this way you know it's not just syssin? Are you installing it the way the instructions say? The first time I loaded PS I ignored them and use module manager instead, but it doesn't work right if you do that. Lots of weird faults that make no sense. I never got it as far as bashing but it's worth you checking over the install process. I'm still having this issue @Volka, yeah. It's been an absolute PITA and prevented me from safely participating in the Great Hunt. @Irruel, I've downloaded, installed, deleted and retried about twice now, making two new profiles. The PVP button is....okay. It keeps spamming flay and not aura-checking, but I can do some workarounds with that by manny-ing with some aliases. However, the bashing is still totally broken. Hey all, sorry for the lack of posts. I tend to not use forums at all. But, a new version of Source will be released later tonight. As always, message me in game or find the Project Source clan, PS. When it comes out, I'll be editing the original post and including the changelog. Looking forward to this. Getting myself a new laptop since since my old one got all FUBAR and lost PS and all the customized bits I had to it. Hope you won't mind me asking you for a bit of help setting it up since I am not exactly very good at this kind of stuff. Bad news, I had a work emergency and couldn't actually finish. Delaying the update until tomorrow. I'll post in the morning. EDIT: Found a major mixup in the code, so I'm going to take a bit longer to fix this. With the release of Wayfarer way earlier than I expected, going to delay Source 1.4 another few days. This way I can add in any defs and special triggers and any other changes that come to mind. I don't have the class (or the means to get it) so I'll be using the arena method. Unless folk want to donate code (or credits!). Please contact me in game as I forget to check forums all the time. My advice is to make a pastebin account, note down the defs, def lines, and deflist lines there (or anything you want in the system) and send me the links in a message. The reason I say make an account is so you can delete it later. I've been looking into pk/hunting systems for mudlet that are available, if any knows of any that an newbie Archivist can use and I guess try to tweak/modify it with very limited coding ability. I don't have an offense for archivist, but I can post my auto-basher. You might be able to get Project Source 1.4 by messaging someone like @Aoi or @Rhyot.